CONNECT WITH YOUR FAMILY & PLAY! These days, it can be hard to find time and ways to connect with your family. Here are some games you can play and activities you can do as a family to help re-connect. During these times of reconnection, real life teachable moments will occur where you can help kids work on their social skills naturally. To encourage open ended creative play and help kids learn social skills naturally, there are some recommended toys and easy to set up play ideas. Get playing today! This is a game from Peaceable Kingdom, known for it's cooperative style game play. All the players work together to get the owls home before the sun rises. Great fun for practicing social skills like cooperating, working together and communicating. Plus it's just adorable!! I just recently discovered HABA games thanks to Table by Teresa. What I love about the games from HABA is that they involve cooperative game play, rather than competitive play amongst players. For children who struggle with managing those competitive type of games, these games are a good place to start. Animal Upon Animal is a stacking game where you work together to build as tall of a structure of animals as you can. We've played according to the directions but we also just free build which the kids love too. I totally recommend this game! This is a Bingo style game. There is a container where the tiles are kept, the dealer pulls it forward and back and reveals two tiles. Whoever calls out the tile first gets it for their board. My kids like to take turns being the dealer, and my 3 year old can manage to get the tiles back in with no adult help. It’s such a great game to increase vocabulary, practice matching, pick up on patterns, and just work on social interactions. There have been many arguments over who said the word first. How do you solve that problem? It’s a good skill to practice with your family before you have your kids play with their friends. One of my dearest friends let me borrow this game after my son played it at her house. My kids love to try to catch the fireflies and they have learned to negotiate taking turns putting in the fireflies. It also keeps them entertained for a long time. It’s adorable! My son loves this game! He enjoys being able to actually use a hammer and hit something. You also have to learn some self control while hitting, because if you knock all the pieces out and the skater falls, you lose! On a couple of occasions, we have played this with cousins, and there are some great lessons there about being patient and waiting your turn. I loved playing Clue with my sister when we were kids! Several years ago, I found Clue Jr and used it when I was working with kids who needed help improving their social skills. The game was pretty easy to set up and was fun to play. They had to pay attention to clues, eliminate suspects and make guesses, just like in regular clue. This was a great game to use with kids to practice social interactions. Fun game where you use marbles, tweezers, a little water and tissues. It’s always fun to see and hear reactions when the “ice” breaks. Each player gets a card. You have to spot the item that both cards have in common and whoever gets it first wins. There are several versions, including numbers, letters, animals and sports themes. It’s an easy pattern recognition game, but there are all sorts of patterns to choose from, so you also have to be a flexible thinker. This game is very popular, but it can be tricky because different people play by different rules. It’s important to teach your child to make sure to talk with people before the game begins so everyone is on the same page when someone picks up a draw 4 or changes the color. It’s good practice to try different uno rules at home and see which ones your kids prefer. You pick a card, put it in your headband, and then ask the people playing with you yes or no questions to try and figure out what you are. You have to think of the kinds of questions you need to ask to get you closer to your answer. It can be hilarious! This game requires some creativity and imagination to make up stories with images you’ve rolled on the dice. There are several different versions of the game out there, and it’s always interesting to see what adventures people tell. This game is addicting. I used it a lot at lunch groups as a school counselor. Kids have also told me they like the sound of the beads when they get dropped into the different sections. Another game that was very popular with the lunch group crowd. Sometimes kids would play tournaments, or have conversations about whether they played offensively (focused on winning) versus defensively (focused on preventing the other person from winning). Everyone has probably heard the sound of the trouble pop-o-matic. I love this game because there are times you have to go back to start, and it’s a perfect opportunity to show flexibility and good sportsmanship skills. I love this game because it makes people to think about someone else’s perspective. What card will be chosen as the winner will change depending on who is judging. This game is similar to Apples to Apples, but uses pictures and captions instead. Everyone can take a turn being the judge, and the judge picks the caption that they think fits the picture best. You have to think about things from the perspective of the judge, so it's another great game to help children work on taking another person's perspective. Note: Both Apples to Apples Junior and Bubble Talk are for 8+, but younger children can play them if they are on a team with someone who can read for them. One of my new favorite games, this is a quick and easy game that would work well for small groups or lunch groups. One card that made my own kids laugh out loud: List things that would make terrible pizza toppings. If you need ideas for good toys, check out toy-ideas.com. Toy-ideas.com (instagram: @toy_ideas) is run by a Pediatric Occupational Therapist who shares her ideas for better toys for parents to choose for their kids. She also offers personalized toy recommendations, try it out! This game is one of my new favorite social skills games! Why? Because not only do I enjoy playing, children really enjoy playing. The main character in the game is Q, a super smart monkey but doesn’t always have the greatest social awareness and doesn’t always think about others. Q’s Race to the Top is super simple to learn. The game has three types of cards: Blue YOU Cards, Green Q Cards, Orange DO Cards. The counselor in me loves the Blue and Green cards, and the mom in me loves the Orange cards. they get kids moving and doing physical things that are fun and a little challenging. It’s perfect for a child who may have a hard time sitting still for a whole game. And the beauty is it makes children stay invested and involved with the game. Having the physical component is the perfect way to balance out the talking parts of the game. Designed by therapists, this game is meant to help spark conversations and connections between kids and adults. There are 4 different decks of cards - person, place, emotion and skill. It's a good way to start tough conversations about big feelings, tough experiences or challenging situations. PeaceMakers is a deck of cards that is meant to help kids practice mindfulness and connect with others. These are great cards to use in at a mealtime or during a family meeting to spark conversations to help kids get a better understanding of their emotions and how they can handle themselves in a safe and healthy way. For as long as I can remember, playing video games has been way of connecting and spending time with my family. I vividly remember when my big brother got the original Nintendo with Duck Hunt. We were in our cozy family den with my brother and sister, so excited to try it out. And he finally let me try it too! Guess what - I wasn’t very good at it, but I loved watching my brother play. Inside: 8 Fun Ways to Practice Listening with Kids using games - perfect for school, groups or even at home! Inside: A simple and fun game you can play with your kids to practice making decisions. You can play it at home, in restaurants, car rides or while waiting. Spending time together as a family is such an important thing to do, especially in this day and age when family time can be so limited and fractured. It’s a great way for families to connect, to get to know one another and for adults to model good social skills for the kids. Kids who have a hard time connecting socially benefit from learning how to play games, how to set them up and how to manage winning and losing in a gracious way. Our family loves to play games whenever we get a chance (which is almost daily), and we’re really enjoying them, so I thought it would be a good idea to blog about 5 more family games. I wrote this blog post a few months ago about family games for older kids, these games are aimed at preschool and early elementary school aged children. I mentally go through the recipe in my head and check the cabinets to see if we have all the ingredients. Indeed we do. So I pull out the bowls, the ingredients and a spoon. Here are several ideas for Random Acts of Kindness families can do together. What a great way to encourage kindness and empathy in your children and connect as a family. Donate books to the library- We took some of our old books to the library a few months ago, and now we have even more to donate. Leave fun items for kids at the park - We live right down the street from a park. We have some extra sidewalk chalk laying around, I think we’re going to leave some at the park for someone else to enjoy too! Do something nice for a neighbor - Our neighbors had a baby a couple of years ago, and we wanted to do something kind for them, so we made them snacks and I made them a baby blanket. Burying Treasure at the Playground - I love this idea from Pennies of Time. We have some small toys in the basement, we’re totally doing this! Gifts for Dance Class - We had such fun doing this! Thank you note to the UPS driver - He’s so friendly and I order A LOT of things. Sometimes really heavy things. I think it would be kind if we wrote him a nice thank you card. If you need some ideas for random acts of kindness - check out Pennies of Time - the entire site is dedicated to teaching kids to serve and doing kind acts. There are lots of great ideas here. Boom Boom Cards - You can do random acts of kindness and track it online! There are different packs you can use as well. 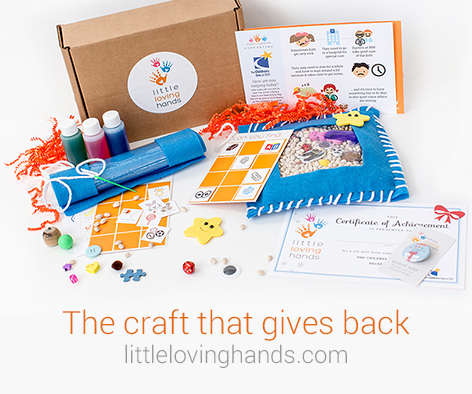 This is the perfect combination of fun crafting activities to do together AND helping others. Check out Little Loving Hands. mytwill.com - For every item you buy, you can donate a blanket to a charity of your choosing. The blankets are made in the USA,100% organic and super soft. See our post about our experiences with mytwill.com to learn more. Toms.com - When you buy a high road backpack, you help support bullying prevention programming in schools. Bombas.com - When you buy a pair of socks, a pair of socks is donated to someone in need. Plus the socks are just super comfy! They now have socks for kids too, and my sensory kid loves them! What is small world play and why is it important? Discovery Toys offer Marbleworks, which is a huge favorite in our own home. My kids can be creative, practice working together, and show flexible thinking, all while having a blast. Looking for ideas to set up a playful home? From the other room, you hear “MooOOOm, I can’t find anything to play with! !” Then you walk into a playroom filled with toys and a 7 year old who has their cranky pants on. How many times have you experienced something similar? Your children have all these toys and they just don’t play with anything. It’s mind boggling, really. Let’s break it down and try to make it a little easier.